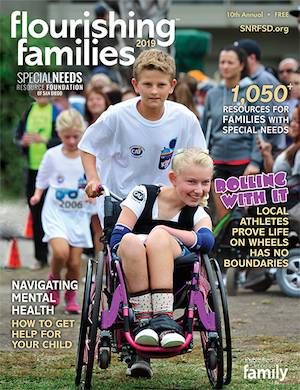 San Diego Family Magazine publishes Flourishing Families, the annual special needs resource guide for families and agencies in San Diego and Imperial County. It is a comprehensive list of behavior, education and health resources and more. Advocacy, Behavioral and Mental Health, Dental Health, Developmental Delay Assessment, Education, General Health, Hospice, Hippotherapy & Therapeutic Riding, Independent Living, Occupational, Physical and Speech Therapies, Parent and Family Resources, Recreation, Respite and Skilled Nursing, Transportation, Vision Health, Worship.